This unique knife block is out of the box ready at 18 1/2" x 22" providing 19 slots to store knives and has a separate compartment for other utensils. 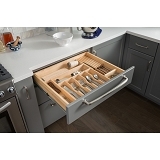 The unique design provides more storage then a traditional Knife Block and with it’s simple drop-in installation valuable counter top space is available to use immediately. 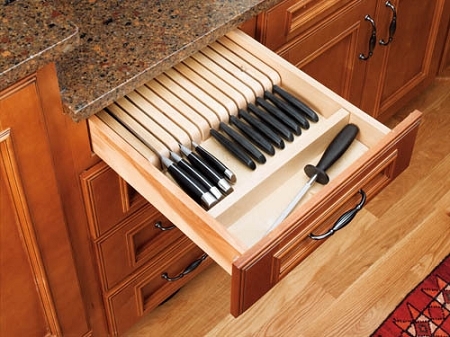 Made of our classic maple hardwood with a UV-cured clear finish to ensure an acceptable match to any kitchen cabinet and can be trimmed to fit drawers of various widths and lengths.